← The sound of snow….. In a blender, place organic heavy cream and cocoa. Blend until cream has whipped. Spoon equal amounts of mousse into the ramekins. Top with sprig of mint or fresh raspberry if desired. Serve immediately. Substitute 1 c. organic almond milk and bring to a boil…add 1 Tb. kudzu powder (great thickening agent for puddings and sauces..many health benefits too!) and 1/2 c. cocoa. Whisk till mixture thickens. Spoon equal amounts of mousse into the ramekins. Top with sprig of mint or fresh raspberry if desired. Chill and then serve. 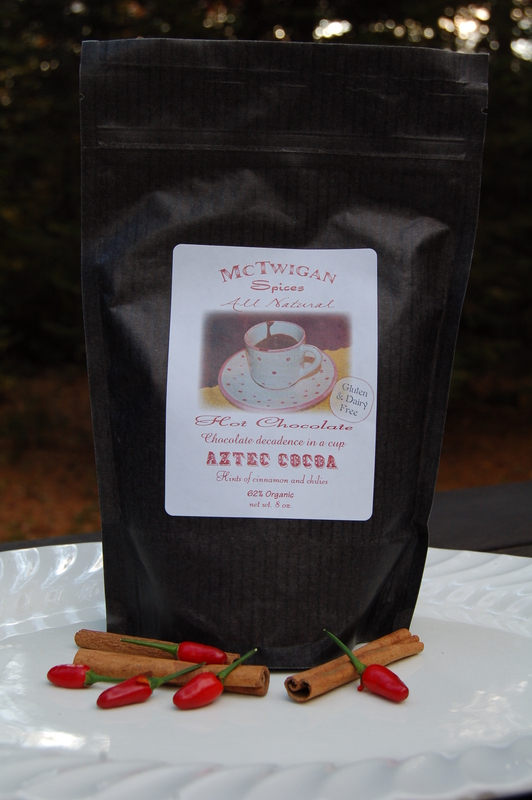 If you want to spice up your chocolate experience…try McTwigan Aztec Cocoa….organic cocoa with chilies! Enjoy the holidays and of course enjoy spring! This entry was posted in Uncategorized and tagged centenarians, chocolate aficionados, chocolate mousse, kudzu, organic almond milk, vegan. Bookmark the permalink. A dairy free recipe – excellent!!! Just curious, why does the almond milk need to be boiled?